Set to soothing classical music by Chopin, this therapeutic exercise video uses slow motion movements that are geared to maintain a healthy body, and aid in the management and recovery of many health conditions, including arthritis, cancer, lung disease, and cardiac rehab. Viewers will benefit from the basic instructions on how to relax the body before exercising, how to properly inhale and exhale during movements, and how to understand the benefits of the slow motion movements. 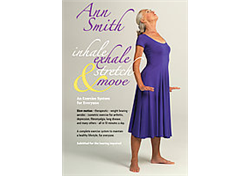 Demonstrated by renowned dance/exercise instructor, Ann Smith, the video includes a Participation Exercise that will help viewers to strengthen and develop muscle tone through gentle at-your-own pace exercises that are easily adaptable to one’s personal pace.